What's New for the 2018 Mercedes-Benz G-Class? The G-Class journey began almost four decades ago when Mercedes- Benz invented it solely for military purposes. Its popularity forced the automaker to reinvent and offer it to the full-size luxury SUV market. Today the G-Class is Mercedes-Benz flagship SUV and one of the most high-end vehicles on the market. Daimler introduces minor updates for 2018 including an AMG® Performance Studio package for the high-performance AMG® G63. The G550 gets a brand-new Designo Manufaktur Black and Red Edition while all trims receive two new exterior colors: Designo Ocean Blue Metallic and Designo Orange Metallic. The 2018 Mercedes-Benz G-Class is a five-passenger SUV available in four main trims: the G550, the AMG® G63, the AMG® G65, and the G550 4x42. All trims get LED daytime running lights, stainless-steel brush guard, and a dual side-exit exhaust system. 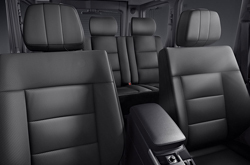 The cabin receives heated and ventilated front seats, heated rear seats, 10-way power front seats, ambient lighting, and Nappa leather upholstery. 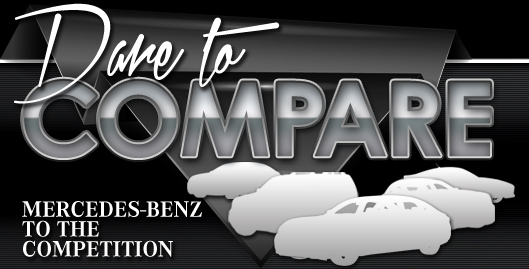 The included Mercedes-Benz COMAND® multimedia system incorporates a central controller and smartphone integration. An AMG® Sports exhaust system, 21-inch AMG® wheels, a Dinamica Interior Package, an AMG® high-performance braking system, and an AMG® Night package are all available on the 2018 G-Class. Nappa/Dinamica AMG® Performance steering wheel, Designo wood trim, and a rear seat entertainment system are also available. 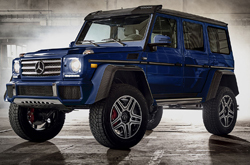 The Mercedes-Benz G550 4×42 adds wheel sizes to 22-inches, two-tone paint, AMG® carbon fiber trim, and stainless steel undercarriage skid plates. It also provides portal axles with red suspension springs and wide wheel arches. Dinamica microfiber with diamond stitching characterize its seats and door panels. The Mercedes-Benz G-Class performs as powerfully as it looks. All models of the no-nonsense SUV come standard with full-time AWD, live axles at both ends, three locking differentials, and a two-speed transfer case. Basically, what that means is that the G-Class drives well both on the tarmac and on an uncivilized terrain. A seven-speed automatic is the only transmission and a fully-loaded model can tow up to 7,000 pounds. The entry-level Mercedes-Benz G550 carries a 4.0-liter twin-turbo V8 that churns out 416-hp and 450-lb-ft of torque. EPA estimates place this engine at 13/14 mpg city/highway. The lifted G550 4x4-squared model with 17.2 inches of ground clearance harnesses similar outputs from the same engine but it is a tad thirstier at 11/11 mpg. The AMG® G63 employs a potent 5.5-liter V-8 mill cranking out 563 hp and 561 lb-ft of torque. The 5.5-liter delivers 12/14 mpg. The top-tier AMG® G65 is home to a robust 6.0-liter twin-turbo V-12 that spits out 621 galloping ponies and 738 lb-ft of torque. Estimates place its consumption at 11/13 mpg. Standard safety equipment on the 2018 Mercedes-Benz G-Class includes a full complement of airbags plus a blind-spot warning, adaptive cruise control, a rearview camera, Parking Assist Parktronic, an illuminated entry system, and trailer stability assist. Mercedes-Benz TeleAid emergency telematics is a standard feature. The standard four-wheel drive system stabilizes the car to an extent and narrow roof pillars, a high seating position, and a short dash ensure a stellar out-of-windshield view.